Now through mid-April, New York will host the world's biggest Easter egg hunt, and it's super-fancy. Now through mid-April, New York will host the world's biggest Easter egg hunt, and it's super-fancy. Fabergé, the company behind a famous series of ornate jeweled Easter eggs made between 1885 and 1917 for Russian tsars and other officials, just launched The Big Egg Hunt. More than 260 brilliant egg sculptures—created by brands, designers and artists—have been hidden across the five boroughs. Successful egg-hunters will get a chance to win blingy Fabergé egg pendants (which normally retail for up to $50,000), and the sculptures themselves are already in the process of being auctioned online to benefit two nonprofits, Studio in a School and Elephant Family. Here, exhibit curator Anya Firestone shares five things to know about the extraordinary hunt. Many of the eggs are super-artsy. Creators run the gamut from Diane von Furstenberg to Warby Parker to Jeff Koons. One of the more elaborate is by artist Chris Carnabuci, whose egg is an homage to the Venus de Milo. As the myth goes, Venus was born from a seashell, yet Carnabuci has crafted, through 3-D printing, the bust of Venus de Milo emerging from an egg shell. Similarly, surrealism aficionados will appreciate Suydam Lansing's flat egg that reads "Ceci n'est pas un oeuf" ("This is not an egg," a reference to René Magritte's similar statement about a pipe). Your phone is the key to finding the eggs. The first step in the hunt is to download the mobile app, which has a map of concentrated zones where the eggs can be found. Your phone will notify you when an egg is near and provide information on its creator. Once you "collect" the egg in your virtual basket, you'll be entered (up to five times a day) to win one of the gem-encrusted pendants. Finding the eggs can be tricky. An incredible crystal-and-bullet-studded egg hides in a Madison Avenue firearms boutique, and near the infamous Trump Towers, there's an egg that looks like origami money. You'll also have to keep an eagle eye out for the striped "Where's Waldo?" egg, which will be hiding in a different location every day; follow @TheBigEggHuntNY hunt on Twitter and Facebook for clues to its location. There's plenty of food on this hunt. Among the many egg hosts are restaurants and pastry shops, such as Omar's, Lady M, Royce' and Ladurée. Firestone recommends stopping at the latter for its delicious omelet. 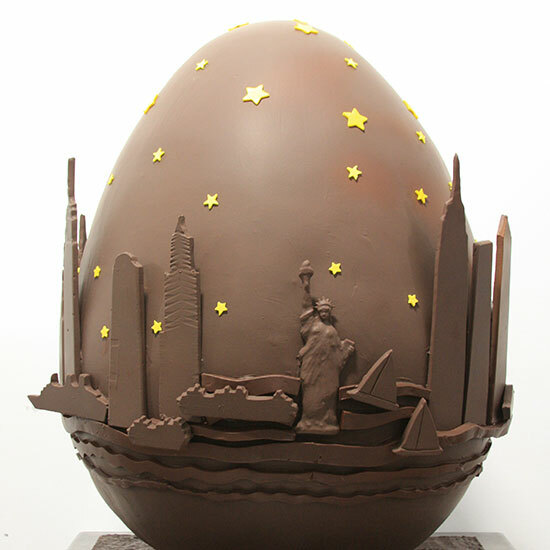 Pastry chef Jacques Torres's egg might break a world record. Torres has created an incredible chocolate egg, which will challenge William Curley's Gunniness World Record title for The World's Most Expensive Chocolate Egg Sold at Auction. Curley set the record at $11,000 during the 2012 Fabergé Big Egg Hunt in London. Torres’s egg is currently on display at his store in Dumbo, Brooklyn.